A good digital marketer should be planning, producing content, monitoring results and communicating with clients on the go, and thanks to smartphones and tablets, you are never too far from the information that you need to succeed. 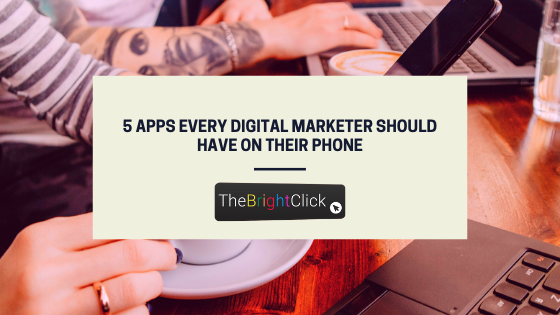 Here are 5 apps that all digital marketers should have access to at all times. This one is for those who are just venturing into the world of digital marketing. Google Primer is a Google run app which actually teaches you everything you need to know about digital marketing through lessons on everything from business planning and management to sales, advertising, social media and SEO. Perfect for when you have five minutes between meetings, this app will keep your digital marketing skills sharp. Perch is a free app which allows you to quickly and easily see any social mentions that your company receives. This means that you can always be on top of any queries or questions that customers might have, as well as keeping an eye on what people are saying about you online. Another useful aspect of this app is that you can add a list of your competitors to see what people are saying about them too. The largest marketplace for digital services, Fiverr is great for when you need a new logo on the cheap, or you would like a video made to help boost your campaign. Allowing you to communicate and place orders with freelancers across the world, Fiverr is a great app to have if you don’t have any existing contacts when it comes to graphic design, writing, branding or proofreading. If you have your own business, you need to have Google My Business on your phone! This simple app allows you to quickly update your opening hours, change your business bio, add posts to your business page or upload photos to keep your business’s Google listing up to date and looking good. There’s no point in doing lots of work if you don’t know that it will yield results and that’s why the Google Analytics app is a must for any digital marketer worth their salt. You can track real-time users, the effectiveness of your landing pages, conversions and so much more with this app from Google.